Vitamin K is important to help support proper coagulation (blood clotting). The liver uses vitamin K to synthesize blood-clotting proteins. Without vitamin K, the level of the blood-clotting proteins drops, and clotting time is prolonged. Vitamin K has also been recognized for its role in helping to maintain the health of bones. 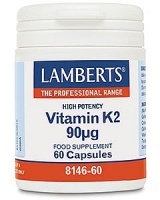 There are three types of vitamin K.
More details are shown below the product listing. Vitamin K helps support proper coagulation. Vitamin K is important to help support proper coagulation (blood clotting). The liver uses vitamin K to synthesize blood-clotting proteins. Phylloquinone, which was discovered in Denmark and termed vitamin K for the Danish word koagulation, is the natural vitamin K found in alfalfa and other foods. It is known as K1. Menaquinone, produced by intestinal bacteria, is K2. Menadione, a synthetic compound with the basic structure of the quinones, is K3. Vitamin K is found in dark leafy greens, most green plants, alfalfa and kelp. Blackstrap molasses and the polyunsaturated oils, such as safflower, also contain some vitamin K. Animal sources of vitamin K include liver, milk, yoghurt, egg yolks and fish liver oils. Absorption of vitamin K takes place primarily in the upper part of the small intestine with the help of bile or bile salts and pancreatic juices. It is then carried to the liver for the synthesis of prothrombin, a key blood-clotting factor. Since natural vitamin K (K1) is fat soluble, it requires bile and pancreatic juice in the intestine for optimal absorption. In contrast, some of the synthetic vitamin K compounds (K3) are water soluble and more easily absorbed. 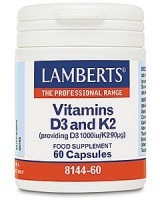 So people who do not tolerate natural vitamin K, such as those with decreased bile acid secretion, may find K3 helpful. 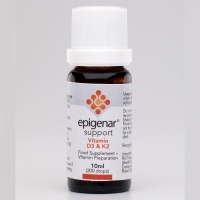 Menaquinone (K2), which is produced by intestinal bacteria, may be the most beneficial source of vitamin K. This is why vitamin K supplementation may be particularly important for those whose normal balance of intestinal bacteria has been disrupted. 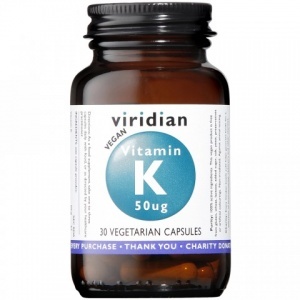 The vitamin K available on this site is a highly tolerable, water-dispersible version of vitamin K.